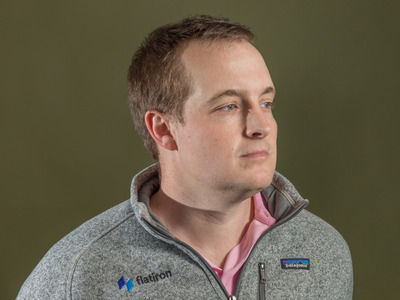 Hollis Johnson/Business InsiderNat Turner, 32, is the cofounder and CEO of Flatiron Health. Nat Turner agreed to sell his company, Flatiron Health, to healthcare giant Roche in February for $US1.9 billion. Flatiron Health creates software for cancer centres that organizes patient data and makes some of it available to researchers, which supplements the results of clinical trials. Turner has been an entrepreneur since he was a kid, with thriving website-building and snake-breeding businesses. He explained how his cousin’s battle with leukemia inspired him to create Flatiron and reevaluate his career. Nat Turner was 24 when he sold his first company, for $US80 million. He just sold another, in February, for $US1.9 billion. Turner, now 32, is the cofounder and CEO of Flatiron Health. It’s a company that’s trying to change the way cancer researchers collect data, with the hope of transforming the way patients are treated. In an interview for Business Insider’s podcast, “Success! How I Did It,” Turner explained that he and his longtime business partner, Zach Weinberg, were inspired to start the business in 2012 shortly after Turner’s younger cousin was diagnosed with leukemia. The boy’s father asked Turner and Weinberg, as tech guys, why it was so difficult for him to find information about childhood-cancer treatments and their effectiveness over the years. Flatiron Health creates software for cancer-treatment centres, with the aim of helping doctors track patients’ progress and figure out what’s working and what isn’t. Flatiron’s programs allow patients’ data to be shared with researchers, offering supplementary information to results of clinical trials. It’s a unique approach that caught the interest of the US Food and Drug Administration, which teamed up with Flatiron in 2016. Turner told us he’s always been an entrepreneur – he had a thriving snake-breeding business as a kid – but he feels emotionally connected to Flatiron in a way he never was with his past companies. Not even the birth of his daughter could keep him from finishing the sale to healthcare giant Roche. The following transcript has been edited for clarity. Nat Turner: A lot of the negotiations occurred when my wife and I were in the hospital. Feloni: So you’re in the hospital. Turner: I was ducking out to take calls in the hallway. Feloni: As your child was being born? Feloni: Did your wife forgive you for ducking out of the delivery room? Turner: Yeah! She did, she did. You know, she was with me when we sold our last business. She knows that it’s a sprint to the finish line, and then once you get to the finish line you’re kind of back to normal. Courtesy of Nat TurnerIn his early teens, Turner kept hundreds of snakes at home as part of his snake-breeding business. Feloni: Looking back on your life, have you always been entrepreneurial? Turner: Yeah, for sure. I’ve always had hobbies. Very passionate person. I can’t do anything half-assed – pardon my language. But yeah, those things – hobbies – usually turn into businesses or those passions usually turn into businesses. I don’t know why, but it’s a pattern I’ve noticed in myself. Feloni: There’s one that I saw on your website where it was something about reptile breeding. Feloni: What was going on there? Turner: Ninety-nine was when I think I started the company, so I think I was 12 or 13. 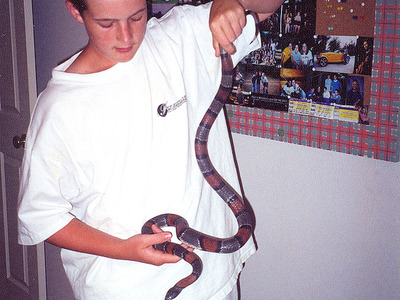 I had snakes as pets and I was – it makes more sense to describe – I was in Louisiana. So, I mean, it’s not weird in Louisiana to have a snake! Maybe in New York. But yeah, I just started breeding snakes to sell them. Pet stores, collectors – believe it or not it’s a huge industry. Back then it was even bigger. Feloni: Did you make a good amount of money? Turner: For a 13-year-old, sure, but I wasn’t going to support a family or anything. Feloni: Did your parents know about this? Turner: Of course. 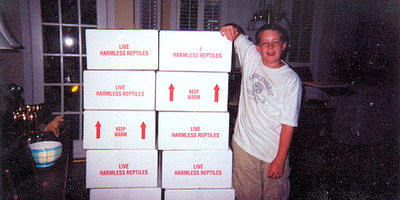 I had hundreds of snakes. Feloni: Hundreds? Where did you keep these? Turner: A lot of places. I had maybe a hundred in my bedroom, believe it or not. In stacked cages. Our garage. Actually a business partner of mine, we built a warehouse – it was really trailers that we put together, trailer homes that we converted, really he converted – and I kept some of my snakes there. It was a real business for him. I was more of a consultant with him. Helping him with his inventory. Feloni: His 13-year-old sales consultant. Turner: At that point I was probably 15, 16. But actually that’s where I learned how to make websites. 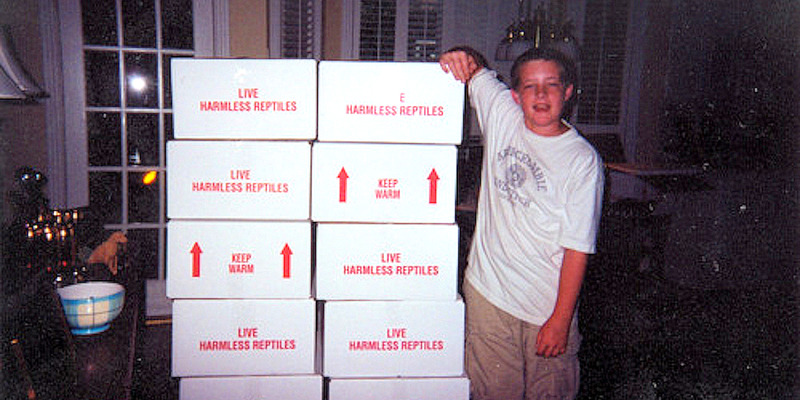 The first website I built was for my snake-breeding company. And then other snake breeders liked it and I started making their websites, and the rest is history. Courtesy of Nat TurnerTurner said it was common to have snakes as pets where he grew up, and he capitalised on it. Feloni: So how long could that have lasted? Turner: Until high school was over. And then I realised that it’s not cool to be in that industry. Feloni: Trailers full of snakes, yeah. Feloni: When you were a kid doing things like that, turning hobbies into businesses, what did you want to be when you grew up? Turner: I don’t ever really remember thinking that far ahead. I’m very opportunistic and optimistic, so I just take the opportunities as they come. I didn’t really have a grand plan. I knew I wanted to go into company-building. I knew I wanted that to be in technology. I didn’t have a great sense for in what industry. So, for example, I went to high school in Texas, and I knew I wanted to get out of Texas because – no offence – but it just didn’t have a great technology scene. It does now, with Austin. Turner: But it didn’t have a great technology scene, and so I went to the best business school I could get into, and that was my chance. I knew I wanted to be an entrepreneur; that was really it. Feloni: When did you know that? Turner: Oh, when I was 12, 13. My dad quit a job, I think, right around when I was in middle school, and started his own company, and that was inspiring. And I was a voracious reader of Forbes and Fortune magazines. You guys weren’t around then, unfortunately! And I was just fascinated by people like Bill Gates and Steve Jobs and Richard Branson. And these were people I used to write letters to, and I remember asking Branson for an internship. He was, like, “I really wish I could. You’re too young. When you’re in college, perhaps reach out to me.” And, you know, that kind of thing. Turner: Yeah, it was cool. It could have been a secretary responding, but it meant a lot to me at the time. Turner: Got his autograph at least! Feloni: Did that serve as a validation for this is where you want to be? Turner: In a small way, yeah. The biggest validation for me was actually building things that people liked, like the websites. I built a lot of websites, probably 50 to 75 websites, somewhere in that range. And, hey, I was making a little money. There’s no better validation than someone liking your work then paying you for it, and so I think that was more of it. Saskia Uppenkamp/Flatiron HealthZach Weinberg and Turner have been friends and business partners since 2004. Feloni: And even when you were in school at Wharton you continued building businesses? Turner: Oh, yeah. I met Zach, my current business partner. This is 2004. Our first day of school we were in the same writing class. It was a class that you had to get into ahead of time because it was so popular – for athletes mainly, because it was the easiest class to fulfil your writing requirement. You had to watch a movie and then write a paper about the movie, and they catered dinner. It was at 5:00 p.m.
Feloni: They catered dinner and you watched a movie? Feloni: Sounds like a great class. Turner: And we were the only two, maybe a few others, nonathletes in the room, and we stood out like a sore thumb. We started talking one night walking home from class. He found out I could build websites and I was into starting companies. I did another thing at the end of high school: I ran gift-card trading online as a website. We had just sold that, and he’s, like, “Oh, I have some ideas too.” And we started brainstorming. He’s one of the best product and startup guys I know, to be honest. And even then he was so good at it. And we hit it off and have very complementary skills. But we started Eat Now, which was a food-ordering website, kind of like Seamless for campuses. 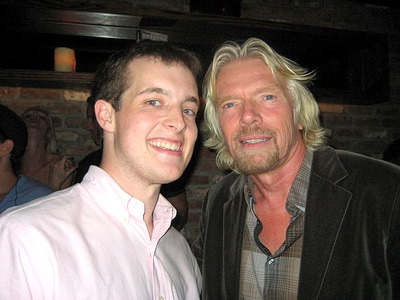 Nat Turner/FacebookTurner had a chance to meet his childhood hero, Richard Branson, in his early 20s. Feloni:And that was your first? Turner: His and my first company. It didn’t do great, but it was a great learning experience. Feloni: And then the second one that you did was Invite Media? Turner: Yeah. We started that junior year. Pivoted like eight times. It was first a Facebook app analytics company, then it became – so many different iterations – but ultimately it became a demand-side platform for banner ads. Feloni: That gets to your point when you were saying that you’re an entrepreneur who’s opportunistic and optimistic, that combo. Is that what just led you to “Maybe this doesn’t work – this might work”? I don’t really know we did that ever intentionally. It’s just our personalities, especially when we’re together. We just like figuring things out and finding out if it’s not smoke and mirrors. So it turns out a lot of the ad world at the time was smoke and mirrors. Turner: Ad networks, ad arbitrage, a lot of manual work behind the scenes. We started meeting these really wonderful people who took us under their wing and they taught us about ads, real-time bidding, and the rest is history there. Feloni: So that sticks, and then a few years later, in 2010, Google buys Invite for $US81 million, right? Turner: Yeah. So that was, like, three years on the dot, like within a day or two of when we started the company and we had – we were only 55 people, largely engineering. We, Zach and I, and basically 50 engineers, for the most part. And, yeah, we show up at Google, they hand us all new laptops, show us our desks – very different than the deal we’re doing now. It was not a subsidiary. I mean, we were being integrated into DoubleClick, which is an amazing platform. Feloni: Yeah, that’s Google’s platform. Turner: Right. Yeah, and the overarching guy there was Neal Mohan, who’s now, I think, running YouTube’s product. And we slotted in so well there – I mean, not personally, but the products. Zach and I are terrible employees, but we became product managers, he and I. The team no longer reported to us. After about nine months to a year – again, we’re horrible employees – I think we drove Neal up a wall with our sense of urgency and just wanting to just break things, move fast. Turner: Well, we just wanted things to happen in a particular way because we’re very used to making quick decisions and all that. Again, credit to Google; they rebuilt the system, and it’s a very powerful platform now. And Zach and I moved on after two years. But the final year with Neal and GV’s – Google Ventures’ – blessing we started researching our next idea. Which is Flatiron. Feloni: So you’re only 24 years old when this deal happens? Feloni: Did that kind of change your perspective on what you wanted to get out of your career? Was this something expected? How did you deal with that? Like being in basically a new playing field? Turner: We never build companies to sell them. We build the best company you can and hopefully they get bought one day. The biggest thing I got out of it was the win under our belt – validation that we know how to build something. Recruiting – we made a lot of great friendships and professional relationships with people at Google and at Invite and many of them helped us or work with us at Flatiron. It helped us with fundraising. It gave us a platform to think about what’s next in a much more free way. When you’re 22 and you’re thinking about, “How am I going to afford my apartment?,” you really have to jump on the thing that is going to get you there quickest. When you get just a little bit of money and you get that platform and that brand behind you, you can really think big. Zach and I always say Flatiron, if it was our first company, would have been a terrible disaster. We would never had been able to raise the seed round that we did. We never would have been able to recruit the people we did. We never would have attracted GV as an investor. Those kinds of things happened because of that prior experience. Feloni: So it seems it was less like a big celebration than more just kind of giving a chance to think even bigger. Feloni: Be a little more comfortable? Turner: Yeah. And we always say, our obituary one day, when we die: We don’t want to say we optimised banner ads online. For us it was we had to get to the next thing. Flatiron HealthFlatiron’s software has a simple design, but its impact comes from the way it links together patients, doctors, cancer-center staff, and researchers. Feloni: So why Flatiron as your next project? Why cancer? Turner: I remember we had a whiteboard at Google. They gave us this little office – probably to contain us. Zach and I and this whiteboard. And we knew we were going to start another company. There was no question. Feloni: How much longer did it take for you to realise it? Feloni: So you’re brainstorming. What’s that like? Turner: We were angel investing. We probably invested in 30 to 40 companies. We told the entrepreneurs, selfishly, “If you lose the money it’s OK. We are mainly selfishly trying to learn from you.” We put this money into various industries. We just really were trying to spread our wings, get our mind around different problems. We started putting money in healthcare. Because that was an obvious thing. And we started looking at a lot of different plays, like insurance and all sorts of stuff. I have a cousin, Brennan Simkins, who was diagnosed with AML [acute myeloid leukemia], and he was actually being treated toward the end of the Invite experience. Feloni: How old was he? Turner: Seven. And they misdiagnosed him twice. Turner: They thought he had aplastic anemia and then ALL [acute lymphoblastic leukemia], if I remember correctly. And my dad’s family is from Georgia. He’s in Georgia. Not a very rural part of Georgia – Augusta, I think the second largest city in the state. But pediatric leukemia is not a super-common thing. And so they had to travel around. They were treated at Emory for a little while, but they ended up at St. Jude. He got four bone-marrow transplants. He probably didn’t realise it, but that simple question actually spurred the whole chain of events. We ended up discarding all the other ideas. We had 50 ideas on this whiteboard. Feloni: Yeah, you were saying the whiteboard. Turner: We had insurance on there, we had medical malpractice on there, we had an idea around anesthesia, an EMR [electronic medical records] for anesthesia, we had tons of ideas. Second-opinion service, which actually Grand Rounds is doing now, is a very similar idea to that. You name it. We had tons of ideas on that board. The first floor of Google, in New York, probably still is, is actually a cancer center. You can take the elevator down to the first floor and you’re right in the cancer center. So we met this doctor, Michael Grossbard, who I think now is at NYU. He allowed us to shadow him when he saw patients. 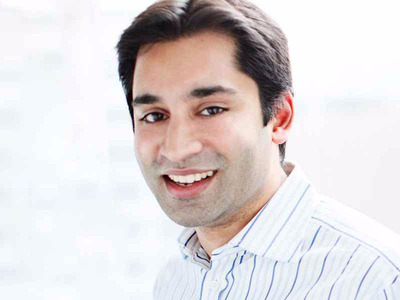 GVGV general partner Krishna Yeshwant helped Turner and Weinberg formulate Flatiron while they still worked at Google. We went to Boston,Krishna [Yeshwant] from GV and another adviser of ours,Vivek Garipalli, who had a lot to do with this, would come with us and chaperone us to add some credibility. We’d meet 20 people a day – oncologists, researchers, pharma companies – while we were employees. We were just obsessed with it. I remember, like, you don’t often get so obsessed about something where you drop everything and drive to Boston and meet with people for 14 hours, taking notes, losing your voice, with no idea just to learn. Feloni: When being opportunistic is such an integral part of being an entrepreneur did it feel different that this was – you were being driven by purpose, if you’re making these trips? Turner: Oh, for sure. I mean the end result, if we were going to be successful, was going to be, instead of a better click-through rate, it was going to be cancer patients got better outcomes. I remember talking about it all the time before the cancer thing we picked. We just wanted something mission-oriented. I don’t know. I think we were so burned out from ad tech it was almost like an overcorrection! Not that ad tech’s bad – it’s created a lot of jobs and it drives how the internet publishers make money. There are a lot of good things about it, but we were a little jaded – disillusioned – by it. Feloni: What is it like after this deal with Roche, for Flatiron, compared to what you felt like after the Google deal? Turner: It’s actually very different. Roche has promised us full autonomy and greater resources. It’s basically a funding round. We get to invest in the company, and we have access to the broader Roche group of companies, like Foundation Medicine and others, where we can build partnerships. Unlike the Invite transaction, where we went from having the whole company to no one within 24 hours, here nothing’s really changed. I show up to work today and I have the same one-on-ones, I have the same client calls, I have the same team meetings, the same leadership team meeting, and it’s business as usual. Feloni: So more validation than anything? Turner: Yeah. Like I said before, it’s validation that the work we did and are doing is important. It gives us resources to continue the mission. It provides us access beyond capital, such as partnerships, data access, et cetera, that will allow us to get to the finish line faster. 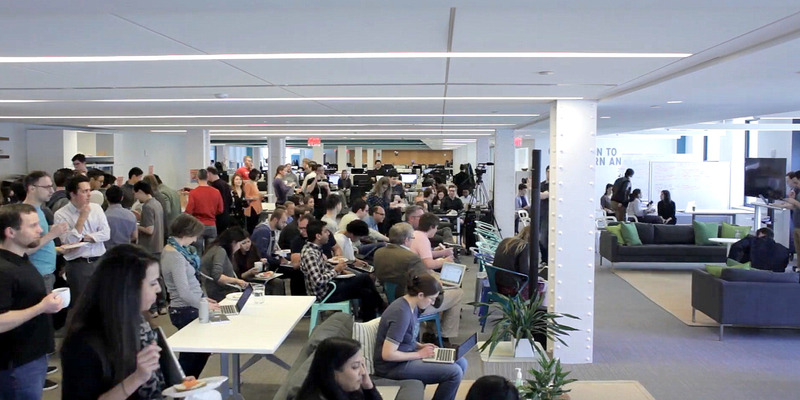 People asked us at the all-hands when we announced it, “Everyone still works for Flatiron?” We had to remind them [that we remained the same company]. It’s very important to people that it’s still Flatiron. Which just makes me so proud. Because the brand has become known as – we’re a very science- and research-driven company and everything we do is to work that evidence-driven mission. You just look at our mission statement. We want to learn from every cancer patient, and for the benefit of future patients. Feloni: Have you talked to your cousin about this? Turner: Yeah. Well, he’s in high school. Feloni: How old is he now? Turner: I think he’s 15. When he’s 18 or 19, I’ll have more substantive conversations with him. I think he realises that he was the inspiration for it. We’ve had him to the company a number of times. He has our swag. We send him swag all the time. Turner: He’s actually a shareholder, too. Feloni: Have you talked to his father about this too? Turner: Oh, yeah. All the time. Feloni: What do they think? Turner: You know, I think they’re proud that while they went through an incredibly difficult experience, that at least something very positive came out of it. They can help others. Feloni: I saw that you told a business-leaders group, “Being an entrepreneur in healthcare takes total rethinking so you can’t be on the inside. My advice is don’t go to medical school. Change is going to come from the outside.” What do you mean by that? Turner: Yeah, I mean, look, it’s a little extreme, but to make a point. Which is, I think it’s true in most industries, a lot of innovation occurs when you rethink things. People can get stuck in their ways and build bad habits or whatever. And it’s healthcare; it’s a regulated industry. A lot of it has become what it is because of – you call them bad decisions or not, bad system design, how things are reimbursed, and all that kind of thing. Medical school trains you to be a doctor; it doesn’t train you to be a businessperson and build companies. Krishna on our board is an internal-medicine doc but also an MBA from Harvard, and he got both at the same time. That’s really rare. Not a lot of doctors get that sort of opportunity. Not that doctors are bad at this, in business. They just didn’t get the training. So you’re just at a disadvantage. You’ve far exceeded, hugely, in terms of your clinical knowledge, but you have a long way to catch up [in business]. And that’s the problem. You get a lot of the clinical approach to problems. Which again, there’s a time and a place for – patient care, hospitals, et cetera – but if something’s a software problem, such as cancer data, it’s not going to be solved by the industry. It’s going to be solved by – hopefully not just tech people, it could be any industry – but someone coming in rethinking how the current system’s designed. I’ll say, though, healthcare is interesting. You can’t disrupt things. You can’t “move fast and break things,” right? Turner: Patient data is a serious thing. You can’t break an EMR because the oncologist needs it to treat their patient. So we used this phrase “thoughtfully disrupt,” where it’s – we’re still disrupting, we’re innovating – but we’re not causing disruption in the clinic. We’re disrupting the industry perhaps, but in a much more balanced way. Feloni: What do you think of the state of healthcare in America right now? Turner: Disarray. It’s unclear what the future is. I think utilization and costs and all sorts of stuff are issues, and uninsured [people] is a scary problem, or underinsured. I wish I knew how to fix it. I think most people would throw their hands up because it’s just so complicated. I think there are a lot of people who are getting away with, not with murder, but with excess profits and there needs to be change in some way, shape, or form. Feloni: So when you’re connected so intimately to the issue now, are you going to be with Flatiron for the long haul? Turner: Oh, for sure. This is a multiyear commitment, not just on paper, but also mentally. 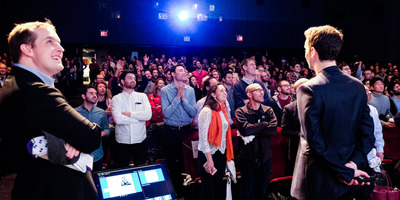 Flatiron’s not just a company for us; it’s much more than that. In some ways, it’s our life’s work, even though we’re still relatively young. Feloni: Is there an impulse in there somewhere of wanting to do a million things at once? Turner: We’ll have our hands in things like we always have. We’re still angel investing, we’re still advising, we’re still helping companies get started. Turner: One of the coolest things is now that we’re over five years old, a few employees have started to peel off to start their own companies and we’re helping them. And, thankfully, a lot of them are going into healthcare, some even in cancer. So that will keep us, I think, pretty busy. Flatiron HealthFlatiron Health gets its name from Manhattan’s Flatiron neighbourhood, where the company was once based. Feloni: And on that note, of the partnership you and Zach have. I’ve seen so many stories where you have two best friends, they start a company, as soon as their little hobby becomes a serious business there’s a clash and they become enemies. How did you figure out how to make this work and still stay friends? Turner: Zach and I, it’s not all rosy and we certainly have our ups and downs, like any marriage. Zach and I like to joke to our wives that they’re the second wives. We’ve been very lucky. We’ve figured out what we’re each good at, and one of our biggest – I mentioned this contrarian thing. One thing Zach and I are, we’re very paranoid. Which drives us, maybe to a fault. Feloni: You still having those 3:00 a.m. mornings? Turner: It’s waned or it’s gotten less bad over time just because we’ve thankfully been able to build a very sticky platform. At the very beginning we were, like, “Wow, we didn’t even know this company existed, and their website says they’re doing the exact same thing as us!” So for about an hour you think, “Why are we even doing this? Someone’s already doing it.” And then you find out that that company’s just a website and it’s a part-time doctor in their spare time. But their website’s spot on! Or “Oracle’s getting into this space,” but then you realise that’s OK; we can compete with Oracle. Feloni: Has this kind of survival instinct – do you still have it? Turner: Yeah, we do. I mean, look, the thing that’s driving us is competition. We love competing. We love questioning things. We love shining light on things. We love building things. There’s nothing better than the response from a customer or patient when they’re, like, “That’s actually what I’m looking for.” That’s what drives us. Ultimately less the economics. And so those are all still true, right? I mean we’re very still much in a battle. Which is great for patients. There are lots of companies competing to build the best platform – the best drug-discovery platform, the best database, the best evidence-generation platform – and that’s only going to be great for cancer patients. There are companies coming in from alumni from Google five and a half years after we did, but that’s OK. They’re onto it now. But that’s great. It’s going to make us drive. It’s going to make us build things better and faster and ultimately that will keep Zach and me pretty excited. 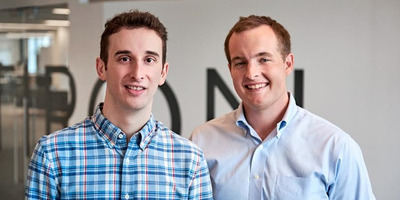 Flatiron Health/FacebookTurner, left, and Weinberg give a presentation to the Flatiron team in January 2018. Feloni: Do you have any advice for entrepreneurs who are pursuing their own businesses right now? Turner: It’s easy for me to say, but if you have the opportunity to do it, do something mission-oriented. Everything’s easier. It’s easier to recruit, it’s easier to fundraise, if you truly care about what you’re – don’t just pick a random mission, something you care about. It’s so much more rewarding. You can build a for-profit company that’s very rewarding economically for you and your employees, which will lead to better employees in terms of recruiting. But look, it’s easy for me to say. Invite had so much to do with our Flatiron success, and while I don’t love the mission that we had there, it’s what made us successful here. So if you have to start a company in a space more opportunistically, it is what it is. But at some point in your career get to that point where you start a company that’s mission-oriented. Feloni: Well, has your shift from that changed your concept of what it means to be successful? Turner: Yeah. To some degree you need resources to be successful in this country. It takes money to make money. You’ve got to invest. You’ve got to have capital. That’s how the world works, and that’s totally fine. But, yeah, there’s a greater – I feel more rewarded about Flatiron, beyond the money potentially everyone could make over time, because of the fact that we’re actually making a difference in cancer. That’s what matters most. Feloni: Is that going to have to define all of your pursuits at this point in your life? Turner: That’s a good question. I’ve been thinking a lot about that. Zach and I are doing a lot of angel investing still. We haven’t really slowed down. We certainly direct our angel investing toward things that are more mission-oriented or create jobs not just help smart software engineers get a more higher-paying job. If we ever start a company again, if we ever help start a company, it’s going to probably be something, if I had to guess – we’re addicted to the mission-orientation thing now. Feloni: Thank you so much, Nat.